Two years ago the Strength for Service team distributed copies of Strength for Service to God and Community to the 1,434 officers in the Metro Nashville Police Department. One month prior to the visit, the department lost 44-year-old Officer Eric Mumaw. The veteran officer drowned while trying to save a driver whose car was sinking beneath the surface of frigid water. Both officers told the assembly how much the death has affected the 1,434 officers. L.W. Smith, president of Strength for Service, presented additional copies of the books to the officers and asked that they be given to the family of Officer Mumaw. Caption: L.W. 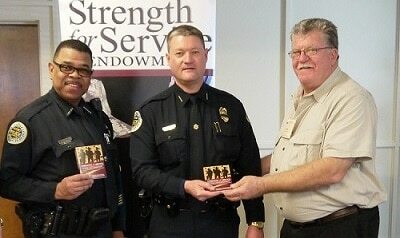 Smith (right) presents additional copies of Strength for Service books to Chaplain James Duke (left) and Deputy Chief Todd Henry.